The Lone Ranger was a 30 minute western action series on ABC about a masked man and his American Indian sidekick who aided those who were being preyed upon by the rich, criminals, and other evildoers. "A fiery horse with the speed of light, a cloud of dust, and a hearty hi-ho, Silver! 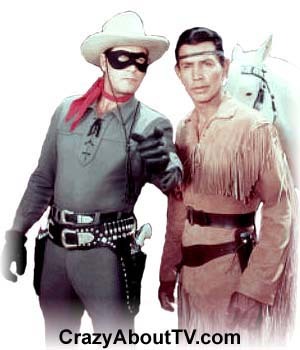 The Lone Ranger with his faithful Indian companion, Tonto, the daring and resourceful masked rider of the plains led the fight for law and order in the early West. Return with us now to those thrilling days of yesteryear . . The Lone Ranger rides again!" Before this TV show, there was a Lone Ranger radio show that aired from January 31, 1933 through September 3, 1954 with a total of more than 1000 episodes!. The radio show even continued being broadcast during the first 3 seasons of the TV show! Thank you for visiting our The Lone Ranger page!